The next phase in the How to Market a Mobile App series was to try a whole new look and feel. While I feel like the design of This to That was actually pretty good, it's obvious design is not really my strong suit. I hired a professional design company that reworked my icon for about $150. I dropped the new icon into the game and had my wife play with the This to That theme generator for a while. She came up with what is now the current This to That default theme. We are pretty pleased with the way it turned out and it appears users are too. 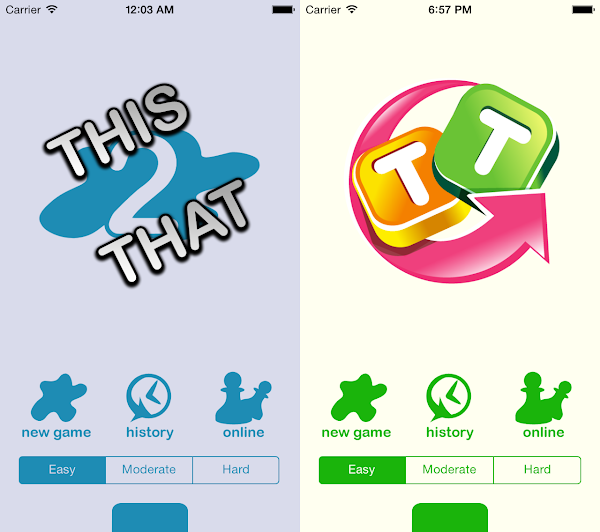 Another thing we changed were the promotional images that show up with the app on the app store. I had reviewed dozens of my favorite apps to see which ones I thought had the most compelling promo images. I noticed I was most enticed by promotional images that featured interesting design with the application screenshot embedded in the image (rather than the whole image itself). In an effort to try something new (and to get a new release out faster), I decided to replace these with simple screenshots. You can see them on the This to That on iTunes page. I may have my designers throw together some new promotional images if I start to get enough data about new downloads that I'll be able to share any significant observations about their effectiveness. The new graphics don't appear to have had a huge impact on new users. It looks like about 10% - 20% more downloads than before. None of the current users have complained in comments or ratings so that's probably a good sign really. I think the most interesting statistic I've observed this time around is in session duration. It appears whatever I added between 3.5 and 4.1 was displeasing to users. We went from an average of 4 minutes per session to about 2 minutes per session. 4.2 brought us back up and 5.0 and 5.1 have leveled us off at about 3 minutes per session, but almost all of our players now play every day. 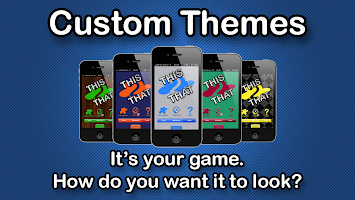 I have a release ready to go in hopes that we get more reviews on the app store (hopefully positive too). We have always had a feedback button in the app, but at some point the link broke so presently it takes you to the app store but not to the app's page. To fix this, we started using appirater. On a related note, I recommend using cocoapods for iOS app dependencies. good observation. graphics does not effect much on new users. App design should be attractive but functionality is more important. I use apphinge.com for my apps. Your information about mobile apps is really interesting. Also I want to know the latest news about mobile apps. Can you update it in your website? If you want to engage your customers, add features allowing them to customize font images, colors, etc. Awesome post its so much informative for the followers and so much helpful also.I appreciate you for this great post.Thanks for sharing.Keep it up. I read and observe your thoughts, your Mobile application development and design is more attractive and I know it’s more helps me in future in mobile developing. Mobile Application Development Services in dwarka are increasingly helping businesses in empowering workers, boosting productivity, and engage customers in a better way. Any successful implementation of Mobile App requires proper requirement analysis and understanding restrictions and potential risks. Mobile App Development in Dwarka is helping businesses in becoming future-ready mobile organizations. Acetech plans, implements and manages mobility solutions that bring measurable business value. Hello admin, you have provided here good information about mobile application. Mobile application Development of the UK are well famous worldwide for the designing which gives such services that provide the satisfaction to the users. This aticle says the importance of using this application is very great.Now i clearly say what is the overall performance and the uses of the application. Useful blog, This is what I have looked for. Share more post like this. Thanks for Sharing such a Wonderful Information!!! Thanks for sharing your information. Great efforts put it to find it which is really amazing. It is very useful to know, Definitely will share the same to other forums. Wonderful blog! This is really informative. Keep sharing more. Great blog comment, thanks for this valuable information.